Senate Panel OKs Loretta Lynch Nomination As Attorney General : The Two-Way President Obama's nominee cleared a major hurdle to succeed Eric Holder. The Senate Judiciary Committee voted 12-8 to send the nomination to the full chamber, where it is expected to pass. Loretta Lynch, U.S. attorney for the Eastern District of New York, testifies before the Senate Judiciary Committee on Jan. 28. The panel voted Thursday to send her nomination to be U.S. attorney general to the full Senate. Loretta Lynch, President Obama's nominee for attorney general, cleared a major hurdle Thursday to succeed Eric Holder as the country's top law enforcement officer. The Senate Judiciary Committee voted 12-8 to send the nomination to the full chamber, which is expected to confirm her nomination. Three Republicans joined the panel's Democrats to vote "yes." Those opposed to her nomination cited President Obama's executive actions on immigration. "We should not confirm someone to that position who intends to continue that unlawful policy," said Sen. Jeff Sessions, R-Ala. Sessions' fellow Republican on the panel, Orrin Hatch of Utah, who voted "yes," defended Lynch. "The case against her nomination, as far as I can tell, essentially ignores her professional career and focuses solely on about six hours that she spent before this committee," he said. At her confirmation hearings last month before the panel, Lynch said she believed Obama's executive actions on immigration were legal and constitutional. NPR's Carrie Johnson tells our Newscast unit that the veteran prosecutor "waited more than 100 days and answered 897 written questions in her bid to become the country's top law enforcement officer. "Democrats on the Senate Judiciary Committee praised Lynch for her poise and her background on fighting terrorism and protecting civil rights," Carrie said. "But many Republicans criticized her support for the White House action on immigration worried she would not be independent from the president." Lynch, 55, is the U.S. attorney for the Eastern District of New York. 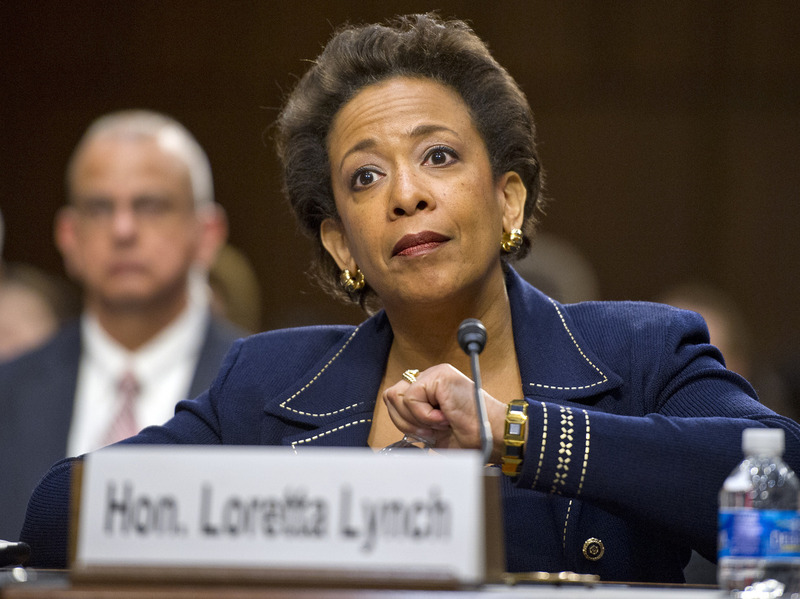 "Lynch is the lead federal prosecutor in a district that serves 8 million people. But outside of law enforcement circles, this daughter of a preacher is not widely known. Friends say that's because Lynch prefers to let her cases speak for themselves." If confirmed by the full Senate, Lynch will be the first black woman to be attorney general.